Ever wonder what it would be like to see a live silent film? If you have, well, you’re in luck. Stolen Chair Theatre Company has brilliantly and beautifully transported the silent film and given it the stage treatment. The Man Who Laughs, adapted from the original Victor Hugo novel and subsequent film, follows the title character, an orphan who tragically gets his face deformed by a group of comprachicos, as he discovers fame, love, and the gravity of appearance in an unjust world. There is great value in words, but when a story can be effectively told primarily through pictures and movement, that’s when you know you’re successful. 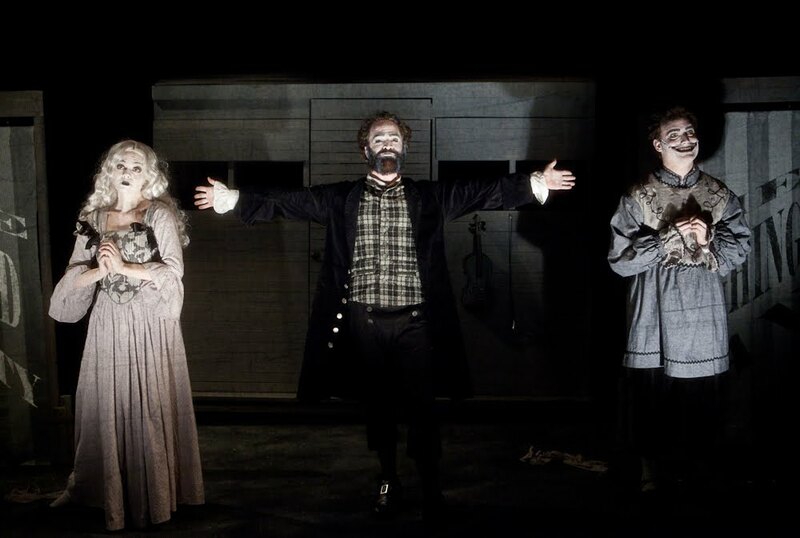 The entire The Man Who Laughs ensemble does a remarkable job telling the fun but tragic story through movement. Taking inspiration from clowning and commedia, the actors’ physical comedy are some of the shining moments of the piece. One of the great examples of this was the skit Ursus has Gwynplaine and Dea perform. Each actor gets a moment to stand out. Molly O’Neill has an angelic quality about her as Dea. Rebecca Whitehurst as the sultry Josiana is quite amusing, offering some wonderful facial expressions. The best performance of the show comes from the title character himself, Dave Droxler as Gwynplaine. Droxler offers so much heart that you can’t help but cheer for him. He is a brilliant physical actor, again shining in the skit scene, leaving nothing out of his performance. And kudos to him, and Noah Schultz, for braving the prosthetic clown smile for the duration of the performance. While the actors are the stars, The Man Who Laughs would not be triumphant without the sublime design. To sell a silent film for stage, it is imperative to have the correct color scheme, which was successfully achieved. Michael Minahan’s set was sophisticatedly stunning yet minimal. Julie Schworm’s costumes were elegant. Despite the monochromatic grayscale, you could imagine the vibrancy. Jaclyn Schaefer as the makeup artist, and Stephanie Cox-Williams, who continues to dazzle with special effects, did a phenomenal job at allowing the audience to forget that behind the thick coats of makeup were Technicolor actors. If the design of the show faltered, the production would have severely suffered. Fortunately, that was not the case. Eugene Ma’s original music evoked the spirit of the period and movie style. It was whimsical when needed and dark when suspenseful. Director Jon Stancato does a great job brining this story to life. Though the only thing that I wish could have happened was his ability to tighten up the transitions with the blackouts and title cards. To say The Man Who Laughs was not a difficult undertaking would be a lie. But Stolen Chair Theatre Company should be praised for their daring production that reminds us that theater can still be transformative and relevant.